Today’s post is brought to you by My Week Is Being Insane So Here’s A Guest Post! Oh yeah, and the awesome website, Hybrid Mom. Hybrid Mom is full of useful content and includes such gems as staying ahead of the clutter and tons of work/life balance content. It was because of My Insane Week that I came across today’s post by Laura Cowan about finding balance as a work-at-home mom. 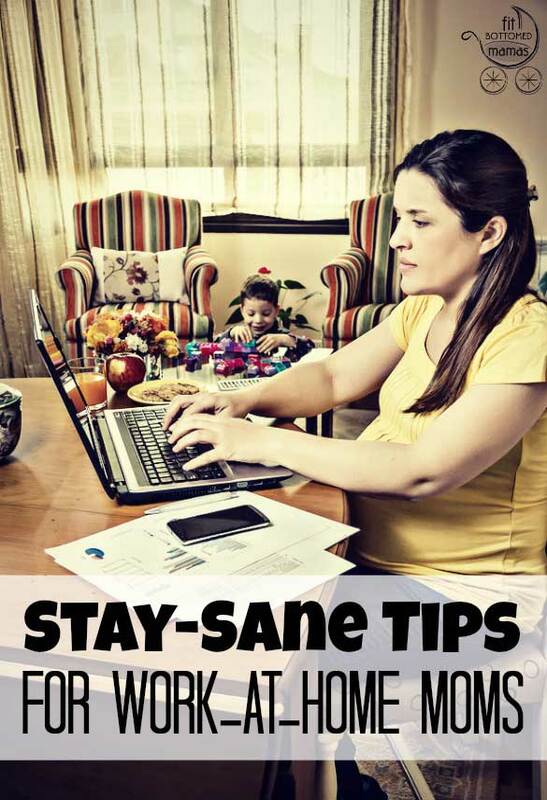 These tips can help you balance the busy whether you work at home, work in an office or just “stay at home,” which, hello, is also work! 1. Prioritize. First off, you need to know what you want to do and why. If you can decide with your partner what is most important to each of you, you can figure out upfront that neither one of you cares if the house is perfectly clean, that you desperately wantto be able to stay home with your baby, and that he just wants dinner on the table every night. Done deal. You may need to adjust your priorities if circumstances change, but knowing what is important is key to finding balance. You can’t do it all, no matter what. 2. Focus. They say that people spend 80 percentof their time doing 20 percentof their work, and vice versa. If the work you’re spending time and energy on isn’t important, you’re spinning your wheels. As a mom, every minute counts. Try paying attention to how much time you spend on housework, email, Facebook (the author kicks herself) and so on. If you’re spending an hour on email every day, try unsubscribing from newsletters you don’t read and just answering the most important messages every day. Put the leftover time to work on something on your priority list. Spending 50 percent of your time on a client who provides 10 percent of your income? Dare to downsize the time spent on his projects, or fire him (politely) and spend that time finding five new clients. You’ll thank yourself later. 3. Block your time. I am able to do some cooking and housework when my daughter is awake, but I can only write when she’s asleep, so I block my time every day to work around her schedule. My goal is that she will never know how hard mommy worked through her childhood because she slept through it! I schedule conference calls during walks in the stroller so she stays happy. An hour of naptime is usually spent working on my blog every day, and I carve out several hours per week for working on my novel. In January, I spent way more time on my novel while I was in a creative flow, pumping out 20,000 words in sixweeks, but then I shifted back to planning giveaway events for 29Diapers.com and worked with my publisher to get a new edition of Ecofrugal Baby: How To Save 70% Off Baby’s First Year to market. Yes, I realize I sound insane, but it’s actually a lot easier when I devote all my energy to one task for an hour or two and then switch. Otherwise mommy brain keeps me in a constant state of trying to remember all the things on my to-do list,and I never get started with any of them. 4. Be flexible. Finally, flexibility is key. Some days my daughter is teething and wants to be attached to me every waking moment, my husband has a hard day, I have too many projects needing attention, and I had to wake up seven times the night before. Come to think of it, that was last week. When life tries to strangle you, step back and refuel. I recently read Bird by Bird by Anne Lamott, in which she described writer’s block not as being stuck but as being empty. That struck a chord with me. When I’m exhausted, everything takes three times longer to do, so it’s actually efficient (not to mention being kind to myself) to take a day or two to just watch a TV show, read a book and eat a little chocolate. No worries. I know from experience that I will be back with crazy energy once my daughter is sleeping better again and my brain turns back on.